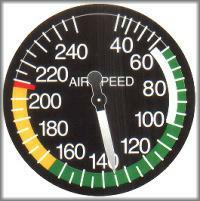 Can you point out design maneuvering speed (Va) on this airspeed indicator? This airspeed is important to know if you are flying maneuvers or flying into turbulence; it is the airspeed at which the airplane stalls at its G-limit. In other words, it is the speed at which the stall protects your airplane from structural failure. You couldn’t find it on the gauge? Well, this important airspeed is never on the instrument itself, but on a placard in the cockpit and in the pilot’s operating handbook of your airplane. Va is decreasing with decreasing weight (detailed discussion on AOPA.org). 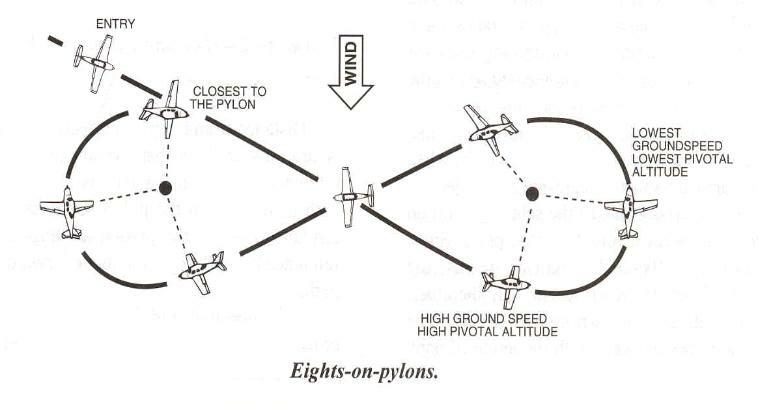 This confused me when I first studied for my pilot license, however, it is important to note that you probably never maneuver at maximum takeoff weight, even after a takeoff at MTOW the fuel burn will decrease weight and increase Va throughout the flight. I remember a crash of a Pilatus aircraft over the Jura mountains in Switzerland. The pilot might have reduced speed into the green arc (236kts IAS), but that wasn’t enough to keep the airplane in one piece. Maneuvering speed is sometimes ridiculously slow, even on high performance aircraft. Specifically for the Pilatus it is 158kts IAS – en route at a lower weight even slower – and this might seem way too slow for an aeroplane like this. Nevertheless, the airplane doesn’t care if the people in its cabin need to arrive on time. The only thing the airframe might care about in turbulence is making it to the destination at all and in that case maneuvering speed is paramount. Now as we know how fast we should be and the area is clear of traffic, let’s look at the maneuvers I learned about in my last lesson. First, a 30° bank is established at full power and pitch is increased until half of the one-eighty is completed. During the second part, the aircraft is smoothly rolled out of the turn, while the pitch attitude remains the same. The angle of attack is increasing (the nose must remain at the same pitch, or height above the horizon) until the airplane is rolled level at the end of the turn and the airplane is within 5kts of stalling speed. I loved flying the chandelle. The Cessna 182RG felt stable in the air and I had no trouble keeping the airplane coördinated. One lesson this figure is supposed to teach is said coördination. During the full power climbing turn, the left turning tendencies increase until its peak at completion of the maneuver – close to stall speed. 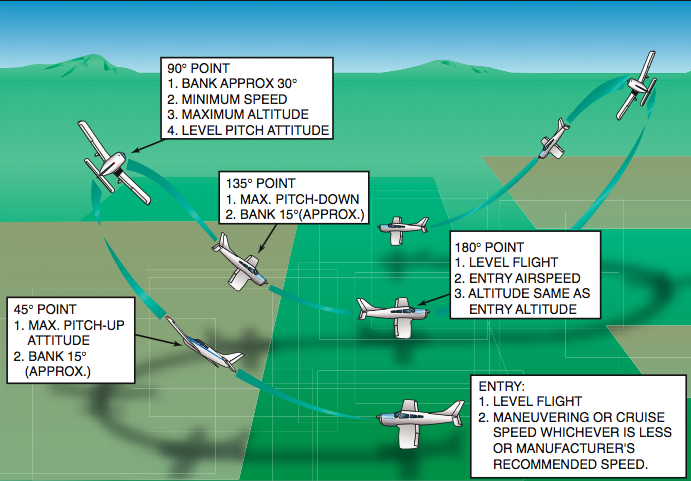 This maneuver is all about pivotal altitude. 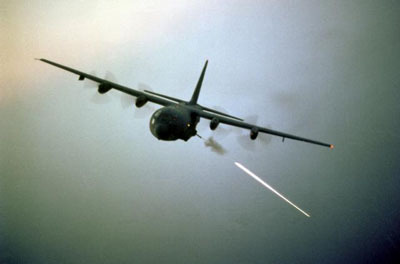 I imagined flying a Hercules gunship flying around a target. The pivotal altitude is at the height at which you can point for example your wingtip at an object and it remains exactly on its spot during the turn. Or instead of using this crazy formula, just start at about 900-1000ft above ground level. 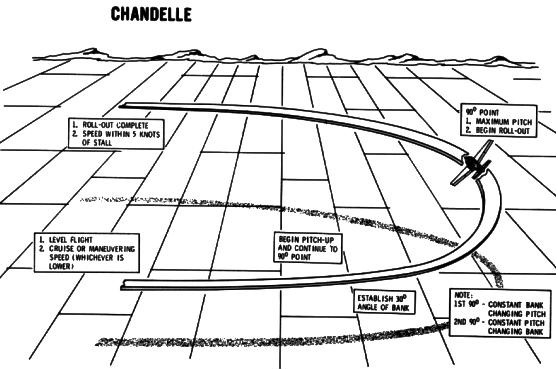 During the turns the ground speed is changing and therefore the pivotal altitude cannot be the same. Whenever the pylon moves backwards along the wingtip, the pilot pulls back on the elevator. If it moves ahead, back pressure is released. This principle was easy enough to understand. The most important moment was the roll out of the turn and shifting the focus timely to the other pylon. Pivotal Altitude remains the same at different bank angles. Lazy Eight, a figure with continously changing bank and angle of attack. I could fly lazy eights all day long. You simply look for a road that is parallel to the wind and cross it at design maneuvering speed (Va) and 1’500ft agl. You zoom up and increase the bank angle to reach the highest point in the turn, just above stall speed (or just below the critical angle of attack for that matter), at which the airplane enters a negative pitch. The power is left alone during this maneuver. The trade off between potential energy and kinetic energy accelerates the aircraft back to the initial parameters Va and 1’500ft agl. Lazy eights are entertaining to fly and, as the chandelle, it is good exercise against lazy feet. Steep spirals are a tool in the bag for forced landings. The steep spiral was the figure I didn’t get right in the beginning; airplanes just turn much tighter than expected. 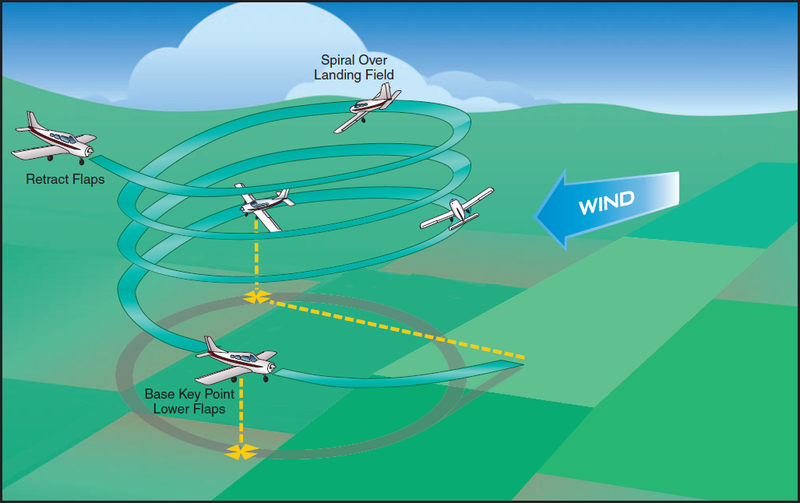 Since this maneuver is intended for forced landings, the entry is made on a high base to a landable surface at best glide speed with the gear extended. I used a crossroad as reference to spiral about, but I entered too far away from center and therefore my bank angle was way too shallow. My instructor told me that the crossroads should always be right below my hip and this would result in a really tight turn with a steep bank. I struggled to establish this kind of turn but learned valuable lessons. For example, the trim tab on the C182RG isn’t effective enough for best glide in a turn. Trimming off control forces is important but in this case impossible. Also, I simply never turned an airplane this tight and the picture I had in mind for the steep spiral simply needed correction. Next time I fly, I will try to stay as close to the turn center as I dare. This lesson was encouraging. My instructor made a briefing for the first two figures before the flight, but it all went so well that we just kept going. It also opened my eyes that the commercial pilot license isn’t just about legal considerations but foremost about angle of attack. Exceeding the critical angle of attack causes many accidents, but there’s good news: The pilot in command has direct control over the angle of attack. Don’t fear it, control it.